VDC monochrome composite to color composite ? While you end up sacrificing resolution for color, you end up with some advantages. One being that you more or less get a 160x200x16 mode with no color cell restrictions using just a simple 640x200x2 bitmap. Or with good use of custom characters in text mode to represent the bit patterns instead, one could even do some decent fast animation. Interlace is even an option, which might provide some nice color blending capabilities. 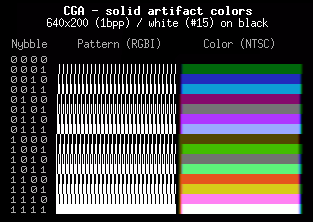 Sure, if you're going to treat the VDC as low res you can simulate 160x100x16 by using 8x2 color cells, but this doesn't need color attributes at all and would be usable by people with 16KB VDCs. Plus you don't lose half your vertical resolution. Anyway, I'm just curious if this is technically possible and how difficult it would be compared to projects like RGBI-to-VGA? And how would one go about choosing a good chroma value in the circuit to produce a nice palette? The one shown in the image above is pretty decent since it's close to the VDC palette to begin with, but as you can see from the article linked below the possibilities are pretty diverse. Can you think of a way a chroma choice could be communicated to the circuit by the C128 itself through the composite signal so that different palettes could be software selected? Yes, I understand that even if this would be possible, it's not very practical. For one thing, it'd be of no use for PAL users, which is an enormous downside. Still, I find the idea interesting. It's not a dumb question and it IS possible. However, it's not easy and would need a fairly complex encoder chip. In fact, it's actually already done for you. there are quite a lot of RGB to Composite solutions around. One being the Amiga A520 modulator. That takes RGBHV and turns it into composite. The big drawback for most of these you have to convert the digital RGBI into analogue RGB first which makes it even more of a complex board. I am actually considering making a dual board like this that would sit in place of the modulator and replace the RF out with S-Video from the VDC. All depends if I can fit it all in that small space. Just a note, I have ordered new boards for my video adaptor that has an S-Video out from the VDC as well as RGB. No idea when they will arrive but I should have them in the store shortly after. to clarify, instead of passthrough for the 40 col output the board now has ALL VDC outputs at RGB and S-Video. It still has audio input passthrough. The big drawback for most of these you have to convert the digital RGBI into analogue RGB first which makes it even more of a complex board. It does? I seem to remember a circuit in this forum that was just resistors and diodes, and a refinement adding one IC for the "brown fix." Am I mistaken? Also, what about all the CGA/EGA/RGB -to- VGA/HDMI converters showing up on eBay? Richard, glad to see you back on a C128 forum! "I seem to remember a circuit in this forum that was just resistors and diodes, and a refinement adding one IC for the "brown fix." Am I mistaken"
Not mistaken but the quality from that circuit is much lower than true logic solutions. You get washed out colours and colour bleed etc. My solution turns the digital input into a digital output that is then put through a standard DAC, this results in no crosstalk between the colour channels from sharing the intensity signal.